Shopping for a Professional to Write Your Thesis? Keep Looking. As a professor, a published author, and a graduate advisor, I’m intimately familiar with the challenge (and occasional frustration) of learning how to write well and publish one’s way to academic glory. I’m also familiar with the challenge of teaching students how to express themselves in writing. I’m confident it’s one of the most significant takeaways from the graduate school experience. Already hundreds of students and business organizations have experienced excellent writing procedures, so you are not going to be a new one. Whew. Thank goodness. Always makes me nervous to be a new one. Especially at my age. 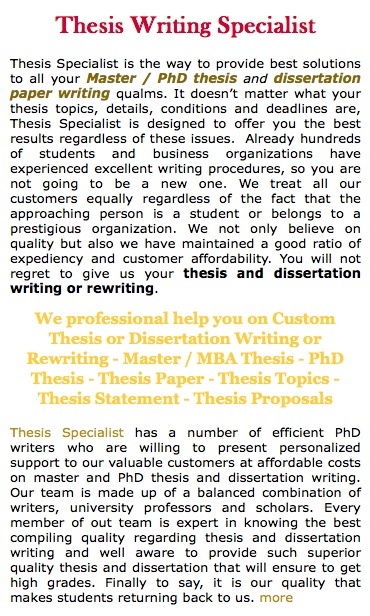 We professional help you on Custom Thesis or Dissertation Writing or Rewriting. And I grateful appreciate them for this. Every member of out team is expert in knowing the best compiling quality regarding thesis and dissertation writing and well aware to provide such superior quality thesis and dissertation that will ensure to get high grades. Finally to say, it is our quality that makes students returning back to us. No doubt. And it is my blogging quality that makes readers returning back to me. This entry was posted in Computers and Society, Personal by knutson. Bookmark the permalink. Sounds a lot like those lottery emails I get every week. BTW, I’m pretty much a gagillionair. So if anyone would like some of it, just send me an email with your full name, telephone number, mailing address, street address, SSN, bank account and routing numbers, the keys to your car, the address of your childrens’ school, and your soul. Dang! Forget about reading that draft of the paper I just sent you, I guess… Now what am I going to do? My wife, who teaches Eng 312 here at BYU, would eat those guys alive. Carnage. Everywhere. It would be spectacular to behold. And I would venture that it _is_ their quality that keeps students returning to them. To implement the revisions their thesis/dissertation committees are requiring. over and over.